A tough high performance machine that takes the strain out of inserting all types of eyelet. Totally air operated, will in one single action punch out a hole in the material whilst simultaneously setting the eyelet or grommet. 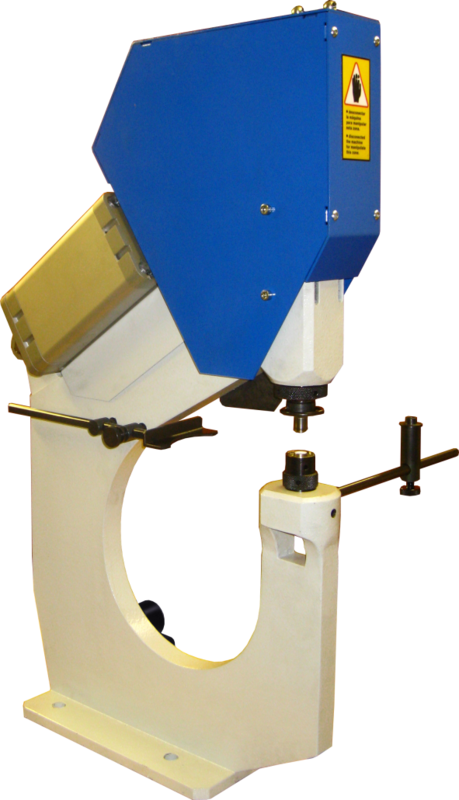 This machine is set apart from others in our range due to the huge throat area that enables eyelets to be fitted far from the edge of the material. Side and Back stop for accurate placement of work. An optional laser can be fitted as an alternative way of positioning material. Foot operated pedal leaves both hands free. Finger guard protection mechanism prevents operation when dies are obstructed. Available with or without bench, or mounted on castors for moving around the floor/ table when working with very large pieces of material.